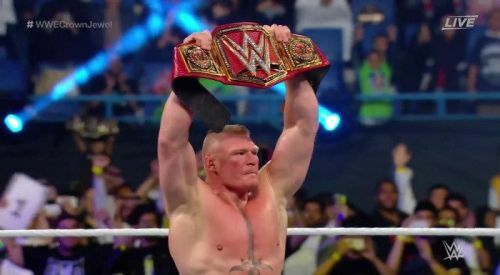 Brock Lesnar, the Beast Incarnate, is the current WWE Universal Champion. In the future, when historians examine the state of sports entertainment in 2018, it will be known as a wild, watershed moment that set the stage for great changes in 2019. There were a ton of big moments in pro wrestling during 2018. Kenny "the Cleaner" Omega and The Rainmaker Kazuchika Okada wrestled the first ever seven star match in pro wrestling history, dazzling fans of New Japan Pro Wrestling and all over the world. We saw one superstar fall to illness, as Roman Reigns was forced to relinquish his beloved Universal championship due to leukemia. But we also saw some beloved superstars return to in ring action, like Daniel Bryan. AJ Styles proved to be a major draw for WWE, while Ring of Honor saw the departure of many of its most popular superstars. Cody Rhodes and the Young Bucks flipped the script on the sports entertainment business with All In, and the WWE made history by having shows in the insular kingdom of Saudi Arabia. It was also a year of many title changes all over the sport, with WWE alone seemingly having over one hundred different champions in one year. Now that 2019 has truly begun, it's time to assess the champions of the various promotions and see how kindly 2018 treated them. The answers may surprise you! Wins and Losses: Even in a scripted performance, wins and losses matter. Championships: Were the current title holders also champions in 2018? How long/memorable was their reign, if any? Popularity: Does the crowd make noise, and do fans talk about the wrestler on social media? Mainstream appeal: Does anyone outside of pro wrestling fandom recognize the champion? Daniel Bryan missed the first quarter of 2018 due to still being on WWE's injured list, but had made up for lost time with a ton of momentum and head-scratching yet successful moments. Turning Daniel Bryan heel was evidently his own idea, and in fact currently Bryan has creative control of his character. This represents the deep respect the WWE and Vince McMahon have for the undersized underdog. But how was his 2018 overall? Overall Grade: B For a man who missed the first quarter of the year, Daniel Bryan had a stellar 2018 but missed time hurt his grade a bit.